Featu red Book: Zimmer, Tracie Vaughn. 2011. 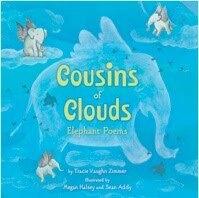 Cousins of Clouds; Elephant Poems. Houghton Mifflin. Zimmer's new collection is another that did not reach my class in time for students to participate, so I am reviewing this one. Lucky me! This collection is already one of my favorites this year! It's a fairly unusual theme for a picture book poetry collection: ELEPHANTS-- and the combined poetry, informative paragraphs, and evocative illustrations create a wonderful package. It's fascinating and absorbing with a wonderful variety of poem forms (haiku, free verse, rhyming quatrain, shape poem, mask poem, blues, letter, sonnet, riddle, and even a "this is just to say" poem). For form alone, this books is an excellent teaching tool. But Zimmer has also done her homework on elephant facts and the poetry (and factual boxes) hone in on fascinating details about elephants (both African and Asian and clear distinctions are made) that take us well beyond the usual. For example, I didn't know homeless elephants were a growing problem, that elephants' memories were so strong they could plan revenge on a cruel trainer, that scientists are studying elephant communication (through "infrasound" and sensitive feet) or that elephants naturally migrate 30-50 miles per day in the wild. Cool! Kids will love the many images of elephants -- their size, their fascinating trunks-- that are revealed through elegant poetry and full color illustrations. With 25 poems, many in double-page spreads, this is a book kids will pore over and nudge each other to read, share, discuss-- and dramatize! No matter where you might travel in the world, you're likely to encounter art that features elephants. Even where they have never been native to the landscape, they have inspired artists and poets for millennia. "a behemoth of hope" indeed-- kids will LOVE that line. I know I do! Certainly kids will want to read more about elephants after sharing this book. Gather nonfiction or informational titles, search the web, investigate area zoos that may house elephants (and study those conditions). Look for ways to contribute to elephant survival, including procuring a painting BY an elephant. And of course many of these poems will lend themselves to dramatization or pantomime. For example, "Trunk" can involve multiple volunteers acting out each of the metaphorical objects cited in the poem (finger, fork, arm, nose, straw, megaphone, telescope, rope) as the rest of the class reads the poem out loud.